E. de Gracia Camara, 2008. The Taj Mahal of Agra, India is one of the Seven Wonders of the World, for reasons more than just appearing magnificent. The history of the Taj Mahal increases the heart to the magnificence. A heart that is filled with passion, regrets, and more love. If it were not for love the world would not be the same but, most important the Taj Mahal would not be here. A model of how profoundly a man adores his wife, that even after she abides but reminiscence, he made sure that this memory would never fade away. This man was the Mughal Emperor Shah Jahan, who was head-over-heels in love with Mumtaz Mahal, his dear wife. Mumtaz Mahal was a Muslim Persian princess and Jahan’s dad was an emperor. It was at the age of 14 that he met Mumtaz and fell in love with her. Five years later in the year 1612, they got married (Ahmed). Mumtaz Mahal died in 1631, while giving birth to their 14th child. It was in the memory of his beloved wife that Shah Jahan built a magnificent monument as a tribute to her, which today known as the "Taj Mahal". The Taj Mahal is located on the right bank of the Yamuna River in a vast Mughal garden that encompasses nearly 17 hectares, in the Agra District in Uttar Pradesh. The monument, begun in 1632, was finished in 1648, unverified but nonetheless, tenacious; legends attribute its construction to an international team of several thousands of masons, marble workers, mosaicists and decorators working under the orders of the architect of the emperor, Ustad Ahmad Lahori. The Taj Mahal's pure white marble shimmers silver in the moonlight, glows softly pink at dawn, and at close of day reflects the fiery tints of the setting Sun (“Taj Mahal”). However, the Taj Mahal can be seen not only as a mausoleum for the empress but, also as the glorious climax of Mughal architecture in India. In a matter of time, something that is full with love and a magnificent monument can turn into such a bad thing. Preservationists say the 350-year-old marble masterpiece is falling prey to shoddy repair work, graffiti, air pollution, and even a deteriorating foundation. The Indian press has been filled with reports that the latest government efforts to control pollution around the Taj are failing and that the gorgeous white marble is deteriorating a possible casualty of India's booming population, rapid economic expansion and lax environmental regulations. Some local preservationists, echoing the concerns of R. Nath, an Indian historian who has written extensively about the Taj, warn that the edifice is in danger of sinking or even collapsing toward the river. They also complain that the Archaeological Survey of India (ASI) has done slipshod repair work and call for fresh assessments of the structure's foundations (Bartholet). All good things end. Will the Taj Mahal really collapse in five years? Both the Indian MP and the historian quoted by the daily say it is a false alarm though there are such fears due to the drying of the Yamuna River. It is a 50/50 chance that the Taj Mahal will collapse. Architects have been expressing fears that a dry river could pose a threat to the Taj Mahal (Khandelwal). After researching the Taj Mahal I will end by saying the beautiful monument has a while before it actually collapse. "Taj Mahal." UNESCO World Heritage Centre. N.p., n.d. Web. 14 Oct. 2012. <http://whc.unesco.org/en/list/252>. Ahmed, Akbar. "The Taj Mahal." History Today 43.5 (1993): 62. Academic Search Premier. Web. 15 Oct. 2012. Bartholet, Jeffrey. "WHAT AILS THE TAJ MAHAL? (Cover Story)." Smithsonian 42.5 (2011): 44-57. Academic Search Premier. Web. 15 Oct. 2012. Khandelwal, Brij. "Will the Taj Mahal collapse in 5 years?." South Asian Post 20 Oct. 2011: 17. Newspaper Source Plus. Web. 17 Oct. 2012. The official Taj Mahal site. History of the Taj Mahal and when it was first built. The architecture and history on the Taj Mahal. 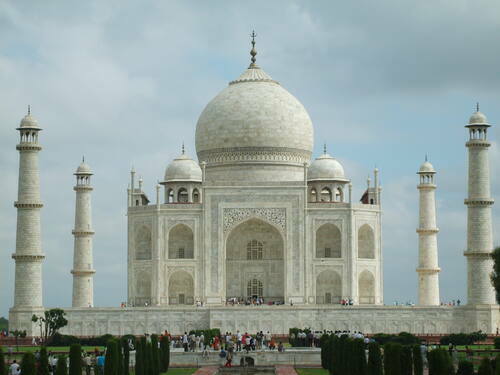 History of Taj Mahal India - A World famous building located in Agra known as Taj Mahal. It is a love symbol and one of the seven wonder in the world. The history of the Taj Mahal tells us "why was the Taj Mahal built" and many myths and fact related to Taj. Shah Jahan built the Taj Mahal in the memories of her loving wife Mum Taj Mahal.